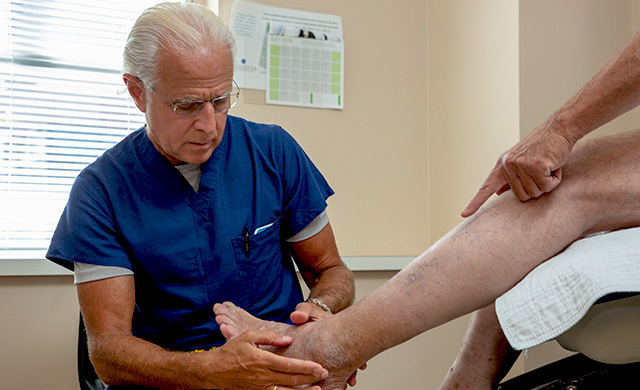 No matter what your age or activity level, or whether you’ve experienced blood clots and vein scarring in the past, our experienced team of vein specialists can help you. To diagnose your vein problem, we’ll start by discussing your current health and lifestyle. We’ll want to hear from you: How does vein disease affect your quality of life? What do you hope to accomplish? Then we’ll confirm that vein issues are the source of your discomfort and assess how your veins are working — typically by using noninvasive ultrasound. We’ll discuss your options and together we’ll develop a treatment plan. Most procedures are minimally invasive; many don’t require more than the use of a needle. When needed, we work in conjunction with the Englewood Hospital to coordinate a complete spectrum of care for you, including wound care. Learn more about Englewood Health’s vascular diagnosis and screening services.